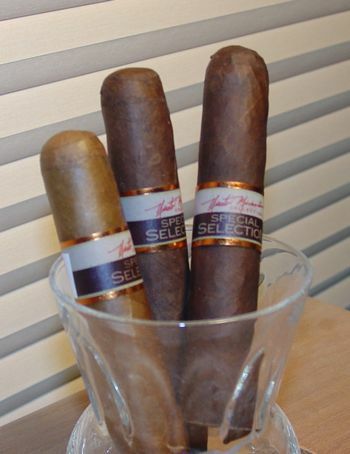 Every spring as the temperatures rise I set out on my annual hunt for hot weather smokes, and this year as I was paging through Cigar Aficionado’s Top 25 one caught my eye in particular: the Nestor Miranda Special Selection “Coffee Break,” which was awarded last place in the standings. At 4 1/2 x 50 it looked like it might just qualify as a Triple Digit Quick Smoke. In the past I’ve gone to Rocky Patel Sungrown Petite Coronas or Pepin Garcia Black Perlas, but I thought I should probably check this one out as a possible contender. 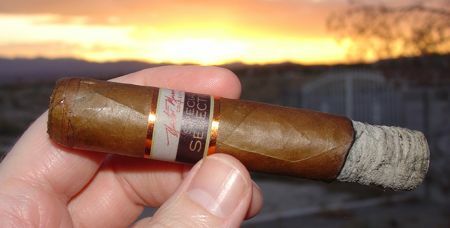 In the spring of 2008, when I first reviewed the Nestor Miranda Special Selection, I had some trouble pinpointing information on the brand. I had to settle for smoking a quite decent cigar without the background information. Poor me. In 2009 all the mystery surrounding the cigar was dispelled by Jose “Don Pepin” Garcia, who was charged with reblending the Special Selection and is now producing them in his Esteli, Nicaragua factory. The wrapper is Nicaraguan Habano, both the natural Rosado and the maduro-toned Oscuro. It isn’t clear if this is the same leaf with a different level of processing, or if each version employs a different Nicaraguan Habano leaf altogether. Different, I would guess, but I don’t know for sure. The binder is Nicaraguan, and the filler is a three country blend from Nicaragua, Honduras, and the DR. Despite the fact that this cigar has been reblended, the two original sizes are still listed in the roster on the Miami Cigar & Company website. They are made conspicuous by having no frontmarks assigned to them, though some retailers are using the frontmarks from the original blend for these vitolas… it makes me wonder if boxes of the original blend might still be floating around out there somewhere. There is also a limited 20th Anniversary edition, the 7 x 56 “Danno”, that some of you probably remember from the promotion last year. Both the natural Rosado and the Oscuro versions are well made sticks, though they both suffer from a bot burn after the mid-point. The Rosado wrapper exhibits a few small veins, but it glistens with oil and is quite appealing. The Oscuro is drier and more rustic in appearance, which is typical of finely aged maduro leaf. Both versions of the Special Selection Coffee Break draw easily and consistently, but they also tend to heat up at the mid-point. I may be smoking these a little too quickly, or it may be the dimensions of the cigar – or both – but I haven’t yet been able to remedy this problem by slowing my pace. Like many cigars with the same interior blend but different wrappers, the Rosado version is quite distinct from the Oscuro. The Rosado starts out with a mild, woody flavor that puckers the cheek lining with tannin. The Oscuro, on the other hand, opens up with a rich chocolate flavor. After a few puffs both of these initial flavors step back, mellow a little, and concentrate on a smooth woody flavor. The aroma of the Rosado is lighter than the Oscuro, but with its notes of cedar and honey it is slightly more nuanced as well. The Oscuro centers on a sweet cocoa to chocolate scent. The second half of both of these small robustos is more intense, but neither goes beyond medium in body. The Rosado turns to a smooth nutty flavor with a smattering of pepper toward the band, while the Oscuro serves up the espresso with the same smattering of pepper, finishing with some char in the last act. Both the Rosado and Oscuro versions of the Coffee Break are fine short smokes, but with their tendency to heat up in the second leg they might require more time than the typical coffee break allows. That aside, I found the Oscuro to be more complex and slightly more enjoyable than the Rosado. 5 to 6 USD per stick seems a bit pricey for a short robusto, but it’s not outrageous considering the quality of the cigar. The question for me is whether the Special Selection Coffee Break will be reselected as next year’s Triple Digit Quick Smoke. The answer: probably not. With the weather getting warmer, we’re also looking for the short and more mild ‘gars. Thanks for the recommendation! I’ve been looking forward to try these ones though I have no experience with nestros at all. Thank you for explaining the reblending. I didn’t realize that at first and found the newer sizes to have a distinct taste difference from the original sizes. I was assuming it was just from the smaller Ring Gages. I’ve found I prefer the taste of the original blend more than the DPG version. I think I agree with you there. I had some burn problems with the old blend, but the flavor was really different — rich and meaty. The new blend is good too, but in a lot of ways it’s just another Pepin. Another alternative if you are looking for a short smoke is the Nestor Miranda SS Gordito. I have smoked both the maduro and rosado in the “gordito” and “gordito torpedo” formats. I’m not sure if I was smoking the new blend or the old. One thing I noticed is that whereas the torpedo tends toward a loose draw, the parejo suffers from a draw that is too tight, which tends to complicate the burn problems noted in the maduro. I prefer the rosado. Better burn and construction and more complex than the maduro.